In 1909, T.D. Haubner of the SS Arapahoe became the first person to use the SOS distress signal call. The ship he worked on had lost its screw near the Diamond Shoals which are also known as the “Graveyard of the Atlantic”. 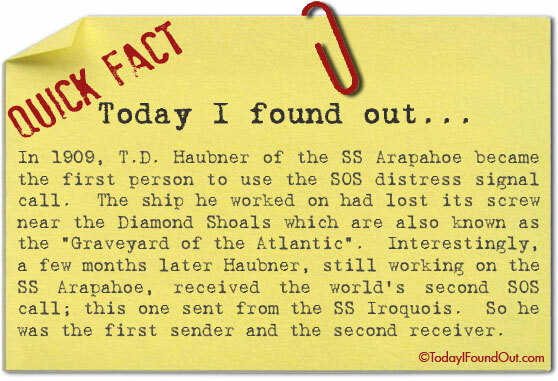 Interestingly, a few months later Haubner, still working on the SS Arapahoe, received the world’s second SOS call; this one sent from the SS Iroquois. So he was the first sender and the second receiver.